Last night I tuned into a WSL webinar, which covered various aspects around staying safe and sound on the Web (how to browse dangerously whilst staying safe). It thought the session was quite useful, not just for my own benefit but also for situations whereby students ask questions around safe Web browsing. The 1-hour session is recorded here if you would like to check it out for yourself. Below is a handy list of resources that will help you stay safe on the Web. Who, by now, hasn’t heard of MOOCs (Massive Open Online Courses)? I certainly had heard of this relatively new phenomenon, but had never given it too much weight. After all, I was not in college nor working in the academic field during what can be considered the explosion of the open online education revolution. Wikipedia tells me that MOOCs were born in the form we know them today in 2008, but 2012 seems to have been their absolute year of fame with even the New York Times dubbing it the ‘Year of the MOOC’. At the end of last month, as I found myself facing another spell of unemployment with nothing lined up in terms of work (thank you, recession), the sudden realisation of a lot of newly-gained free time prompted me to have a look at what MOOCs offerings were out there. I had a look at one of the major players in the field, Coursera, and I was struck by the breadth and depth of options of their free online courses. There are obviously other MOOC providers out there, but my search that day ended there. In fact, it didn’t take me very long to fall in love with one of the Coursera offerings, a module on metadata taught by Dr. Jeffrey Pomerantz of the School of Information and Library Science at the University of North Carolina at Chapel Hill (quite a mouthful as Dr. Pomerantz puts it!). 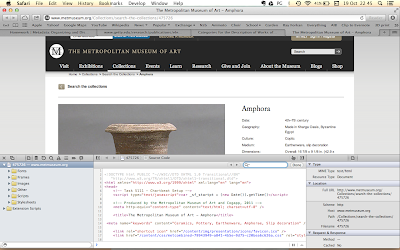 I had come across the University of North Carolina in the past few years for some of their work done in the field of digitisation and digital curation, so somehow I felt connected to them – the quirkinesses of the web. Also, after working with metadata for a while, I was eager to go back to basics and brush over all of the theory and conceptual models I might have forgotten while working on specific datasets and schemas, in order to get a fresher look on the subject and maybe even get to do some XML coding – happy days! So, without thinking too much about it I set out to enroll on the Metadata: Organising and Discovering Information course (#MetadataMOOC on Twitter). Unfortunately for me the course had already started 3 weeks before. Nonetheless, the nature of the MOOC model allowed me to enroll at such a later stage without any real impairment to my learning, except for the fact that I would not be able to submit previous homework on time and get formal accreditation for it. But I didn’t mind this aspect, as I felt my main goal was to learn, not to gain points. The signing up process struck me as the easiest ever, similar to those online products we revere so much for their user-friendliness. In a minute I had created my Coursera account and I was subscribed to an awesome looking course. I was immediately launched into the deep belly of a well-structured academic module. The video lessons neatly organised into units stacked in an orderly hierarchical tree, with only the ones done so far visible on the page, thus allowing for a bit of mystery surrounding future lessons still to come. The lessons’ titles were simply music to my ears: thesauri, Dublin Core, LCSH, HTML, DTD, CDWA Lite etc. In addition, some interesting links to be explored were grouped on the left of the workbench: announcements, downloads, homeworks, sillabus and even more appealing ones such as discussion forums. There was even a Mapping the Metadata MOOC link, where pins had been dropped on a Google Map to show the location of all course participants – thousands from what I could see, and literally from all over the world. This was getting exciting by the minute. After the smooth, user-friendly experience of the signing-up process I went straight to the introductory video of the first unit of lessons. Even though my Mac uses HTML5 and a message popped up on the page saying that I should switch to Flash, the video launched without glitches and the course began. 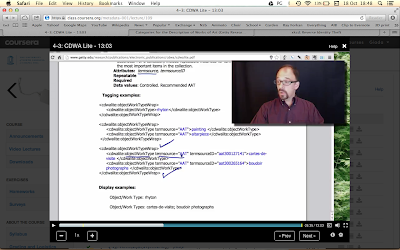 Dr. Pomerantz started with a welcome and a warning: this was going to be a course for total beginners, perfect for those with very little knowledge about metadata. At first that struck me as perhaps not very appropriate for me. However looking at the syllabus the course seemed to be so comprehensive, and judging by the lessons’ titles very detailed, that I was not put off by it and decided to plough ahead. 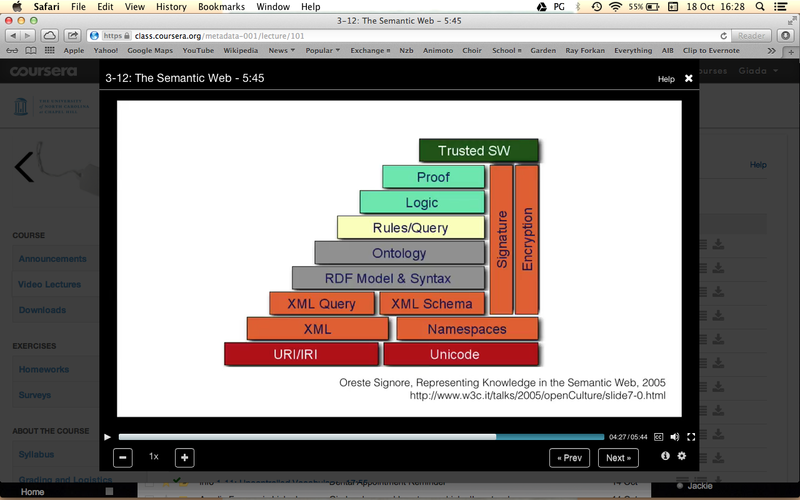 The academic flavour of the MOOC experience was now beginning to tickle my taste buds. It was like being back in university, but without having to pay fees, how bizarre! The introduction was quickly followed by a couple of brief lessons engineered around the idea of finding examples of metadata use in our daily lives: phone metadata and the NSA scandal of metadata harvesting (metadata *is* data), the new tagging feature of the latest Apple operating system Maverick, all tangible examples of metadata in action around us. The course then continued on to explore Dublin Core - there’s an entire unit dedicated to it - plus a whole host of metadata schemas and controlled vocabularies used to produce metadata for digital objects of all sorts. This is how much of the course I have explored so far, and I have to say I am very impressed by it. The homework in the form of multiple-choice questions peppered with more practical exercises is very meaningful and the lessons are enriched by links, recommended readings and interviews with inspiring practitioners in the field of metadata and digital preservation. In particular, I must mention a very good interview with historian and archivist, or rather free-range archivist (yeah!) Scott Jason (@textfiles) of the brilliant Archive Team and the even more brilliant archive.org. In a very insightful conversation with Pomerantz, Jason pointed out that through initiatives such as the Internet Archive computer history has changed forever. It is thanks to the dedication of various teams of professionals, but also of many amateur (read: nerd) collectors of all times out there, that an extensive library of videos, music, books, magazines and even software is now made freely accessible to everyone on the internet. Such efforts are so important if we wish to preserve the current and recent history of computing technologies, while securing future access to the metadata that is being constantly produced. Faced with such a wide-scoped digital preservation task, we can only try our best to save as much as we can from oblivion, obsolescence and data corruption, without falling into the illusion that we can archive and preserve everything that has ever been created in the digital world. At the end of the day, in Scott’s words, ‘life is lossy, it is not a lossless protocol’. Preserve we can, but preserve everything shall remain mere utopia. Digital Dieting addresses a question that is fundamental in teaching and learning today, and one that will be particularly resonant with any LIS professional: In our overcrowded digital lives, how is information "judged, sorted and sifted, to separate the basic and simple from the important and complex?” Here, Tara Brabazon offers a brave and powerful insight into the day-to-day reality for students faced with this very challenge, and what the solutions might be. Her discussion is initially presented in the context of Arum and Roksa’s Academically Adrift, a study which suggests that college students often fail to develop the higher-order critical thinking and reasoning skills we might expect. An avalanche of new media formats and digital information, coupled with a lack of essential literacies are fuelling this problem, Brabazon argues, which necessitates “digital dieting”. The culprit - “information obesity”- often manifests itself through the oversharing of personal information, a culture of copy-and-pasting over note-taking, reproduction of content rather than interpretation, and often a lack of personal responsibility for one’s own work. At the extreme, in Brabazon’s experience, it can result in students treating “academic staff like shop assistants”. Education has become a commodity. Students are seen as consumers, rather than producers of their own learning, and there is a growing expectation on their part that their lecturers should answer every question and query instantly, rather than having to find an answer for themselves. Brabazon describes the confusion that many students (of all ages) experience with leisure and learning when it comes to social media tools like Facebook and Twitter, mistakenly conflating both concepts and unable to distinguish the boundaries between them. Whilst such tools can help certainly build social connections between student and teacher and encourage interactivity, focussing on the technologies rather than the teaching will have a negative impact on the quality of learning. In contrast, Brabazon showcases some examples of using educational technologies successfully, particularly audio formats, in an integrated way, rather than simply as an add-on or as a means of replicating a lecture. Her experience suggests that when presented with appropriate formats and well-structured content, students actively engage in independent and self-directed learning, even recording and uploading their own seminars. However, we often assume that the endless new channels and emerging technologies automatically have the potential to help support learning and increase engagement. But Brabazon makes an excellent point: it is often those who are already engaged, performing well and in need of least assistance who also make use of these additional channels, rather than those who are disconnected or adrift from the academic experience. Indeed, there is little evidence to suggest these new platforms help to draw in the disengaged, who may fall even further out of reach with the introduction of yet more media and information channels. One of the most fundamental issues is the challenge faced by first year students who have no basic subject knowledge and no knowledge of the key authors in the field when arriving in University. They typically have little or no context or scaffolding around which to contruct their own new learning, and so when confronted with a sea of the unfamiliar, the obvious solution is to reach for the comfortable and easy, which is often the same information that is pushed to them through social and other online media. Removing the easily-reached introductory sources (textbooks, Wikipedia, encyclopaedias) forces students to stretch themselves, and to find and evaluate good sources for themselves. Brabazon goes as far ‘banning’ the use of Google and Wikipedia until they have acquired sufficient expertise to use them correctly. Whilst this may seem radical or unnecessary to some, it does drive home the point that we need to make sure we are helping our students to realise the value of selecting the most important sources rather than simply the easiest. A favourite principle of mine when it comes to information literacy is “less is more” and Brabazon adopts a similar attitude in some respects. She argues that reducing information choices and options “reorients the focus to the quality, rather than the speed and scale, of returns”.Brabazon’s strategy goes as far as preselecting and compiling reading material and directly providing it to students, in order to give them a baseline level from which to develop their own information skills and knowledge. I think this philosophy is particularly effective in IL instruction, and have found that the more sources or databases you introduce in a single session, the more confusing it can become for students. Reflecting on my own approach to information literacy instruction, when engaging with early undergraduates I adopt a similarly pragmatic strategy. I typically pare down the material I cover to two or three key messages or concepts, leaving out a lot of material I feel I ‘should’ be covering. If I explore one or two key databases, there is a greater chance of them using one, than if I list out 8 or 9. Building instruction in a programmatic, consistent and gradual way over time, and drip-feeding sources and skills over the course of three or four years can provide a bread crumb trail that supports self-directed learning and confidence, rather than overwhelming the user from the outset. This kind of scaffolded approach is so important in learning; as Brabazon encapsulates, “we cannot put words into a search engine that we do not know” (p. 55). Perhaps not only do out students need to start digital diets, but some of our information literacy instruction could also look at going 'back to basics' also? A large portion of the book discusses the various actions and approaches for ‘detoxing’ and ‘dieting’. Brabazon’s recommended strategies are rational and practical ones. A first step can be reducing or rejecting automated choices in favour of more considered, reflective ones. Stopping ‘pushed’ information and notifications, and instead actively choosing the information we receive is one fundamental change that can be introduced. Moreover, making a conscious effort to reduce the amount of content you produce, focussing on quality, well-crafted and considered messages over quantity, extends this idea beyond our role as passive consumers of information. Focussing on using and understanding a single or small number of media platforms rather than everything at once can also support higher quality learning and increased engagement. However, developing the mindset that “information literacy is more important than information availability” (p. 31) is an essentially simple, but far from easy, task. I fear that some "information obesity" habits may be deep-rooted ones acquired over many years, and consequently difficult to 'unlearn' or change without the motivation to do so. Devising strategies for achieving success with this cohort may prove more challenging. The breadth of the book is staggering at times, as Brabazon explores a wide range of issues that surround the digital media and information landscape today, including the concept of digital justice and equality, how the ‘conspicuous consumption’ of iPads and other branded technologies can ‘control’ the information we receive, and how to help learners effectively migrate through the different stages and levels of literacy. Throughout, Brabazon’s strategies are delivered in a way that is refreshingly personal, honest and passionate. Her desire to improve the quality of student learning and engagement permeates every page. Some of her ideas and techniques may (inadvertently) make great soundbytes, however this is a book about a lot more than the idea of banning Google for first year undergraduates, and it would be very wrong if that were to be the main focus of what is a wide-ranging, thought-provoking and much-needed discussion. 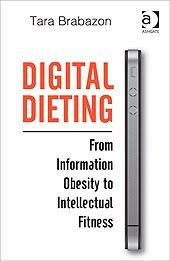 Digital Dieting by Tara Brabazon is published by Ashgate, October 2013, £35. I came across this interesting study the other day, which looked at creating patron focused library services from a retail service perspective. While a few years have passed since its completion, it’s intriguing to see how a consumer behaviour research and consulting firm for commercial environments had input into library service design. Back in 2008, Envirosell was drafted in by the Metropolitan Library System in Illinois to assess four regional libraries. The research objectives were 1) explore the dynamics of visitor behaviour at four Chicago area libraries, including both public and academic libraries, 2) measure visitor interactions at touch points in the library, 3) generate information on how public and academic libraries in the Chicago area can better service and educate their visitors, thereby creating a more satisfying library visit. What struck me was the sheer intensity of the research project. Over a period of only two days in November 2007, 424 visitor groups were observed in all libraries. Observation involved the use of mapping programmes to track and time library customers’ movements and interactions. Small video cameras were also placed in all key areas of the libraries to record behavioural patterns, traffic flow, wait and transaction times. A total of 750 hours of footage was generated for analysis. Upon exiting the library, all customers were asked to complete a questionnaire enquiring about their library experience and the services they regularly use. In addition, 267 customers were interviewed after their library visit. The detailed findings of the study can be accessed here. It’s not so much the research findings that are of particular interest here (they are, but the study is six years old and a lot has happened in the library world since), but the research methodology applied and high granularity of results produced (the research methods toolkit is here). For example, the researchers differentiated between the activities “Pull” an item (– means the visitor touched the item on the shelf with interest, or pulled the item from the shelf. Touching items in the process of looking for a specific item does not count as a pulled item) and “Take” an item (– means the visitor takes the item off the shelf and away from the aisle. Take does not imply the visitor will check out the item). Further, the study differentiated between two important facets: customers’ stated attitudes versus tracking their actual behaviours in the libraries. importance of library signage (see pp 60-66 of the report). 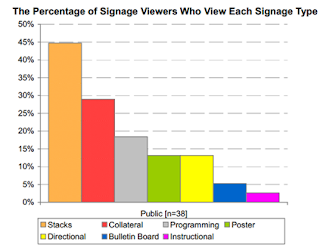 A considerable number of signage viewers (45%) looked at Stacks/Dewey signage during their library visit, which highlights the importance of carefully designed shelf-signage. You can find the recommended best practices summary as a result of the study here. Much of the discussion around altmetrics to date has centred on the debate around measuring impact, and whether traditional citation-based measures can offer a true reflection of the use, engagement with and value of research to the broader community (and not just other researchers). However, a recent tweet from William Gunn articulated something I have been thinking about myself lately, that is the wider function that these new emerging measures of research impact can serve in helping readers to position an individual article or book in the wider conversation. Pulling up the altmetrics data for a recent PLOS article reveals a lot more than just a number. For instance, by showing who is bookmarking an article and saving it to Mendeley, it tells the reader something about the other people who are interested in reading, discussing and potentially using the research. Drilling down into the 184 tweets (as of Friday lunchtime) tells you not only who is interested in it, but how and why they are interested in it. Which pull quotes and extracts are they tweeting? What is the key 140 character message from an eight page paper? What is the primary idea or result that this article contributes to the existing body of literature and the current debate? In real-time, you can see how an article is interpreted differently by people who may have contrasting priorities, perspectives or disciplines. Whilst one person zones in on the quote that "the impact factor may be the most satisfactory of the methods" another asks “what does this ultimately mean for the REF coming up in the UK?”. The Google search results reveal which blogs, news and other web sources are talking about the work, and what they are saying. All of this information contributes to something incredibly valuable for the individual reader: context. This is particularly key for those with poorly-developed information literacy skills, who may view or interpret a single article in isolation without understanding that it represents a mere moment in an interminable scholarly conversation. By opening up access to a world of informal discussions in real-time for readers, altmetrics potentially offer a lot more than simply an alternative measure for a researcher's CV. Just over a year ago, I wrote a blog post looking for participants for a survey on how LIS professionals and researchers select a journal for their research. Those who completed it may be interested in the results, which have just been published in Library and Information Research. One of the most interesting findings was the relatively significant percentage (around 20%) of respondents who rated open access (either Gold or Green options) as unimportant or not at all important when selecting a publication. I would love to do more work in this particular area, so if anyone out there has any ideas or wants to get involved in a study, please let me know. Thanks again to all those who took the time to complete the survey, and to LIR for publishing it. The new semester is in full swing and the number of students spending time in the library is steadily on the increase. Whatever the workload you are experiencing, below is a list of five useful and free librarian webinars for the month of October, just in case you have some idle time to kill! The areas covered include library space design, reader services, early literacy, safe Web browsing and advanced MSWord training. In this webinar, Elliot Felix will provide an overview of trends impacting the design and operation of library spaces as well as the services offered within them. He’ll also introduce some tools you can use along with advice on how you can put them into practice. There will be an opportunity for interaction throughout and Q & A at the end of the session. This webinar expands on basic premises and practices of reader's advisory, exploring new ways to address the needs of your library's core constituency of readers. As libraries evolve and adapt to changing circumstances, it is crucial to our continued community relevance that we retain and serve our core constituency of readers. Reader's advisory specialist from The Seattle Public Library will expand on the basic premises and practices of reader’s advisory, sharing how to apply these practices across new platforms and technologies, enlist social media and catalogues to serve readers, and use form-based and virtual reader's advisory. Learn expert techniques for using the latest generation of advisory resources and other ways to better serve readers in libraries large and small. The first webinar in a three-part series on early literacy (Early Literacy In Your Library), this session will introduce best practices and highlight model programs related to the ten key ways that libraries can improve early learning outcomes. The goal is for library staff to implement best practices and to be inspired to begin planning new programs and partnerships that will increase school readiness for preschool children in their communities. Provided by the Texas State Library. Get informative tips for Microsoft Word 2010 documents. It is now easier than ever before to save time and simplify your work while working together and doings so from more locations. Witness how Microsoft Word 2010 facilitates the collaborative process, handles large documents, and provides easier building blocks for more clearly defined content. This session is for individuals who spend significant time writing and creating documents and have some familiarity with Microsoft Word. Ahniwa Ferrari, Web Content Manager for WebJunction, shares his strategies for staying safe in a dangerous online world. He will cover tips and tricks to secure your browser, privatise your social networks, and get rid of viruses, malware, and that annoying Ask toolbar that installed itself in your web browser. Content covered will be useful for library staff and knowledge gained can be shared with library patrons of all types. Is it a Case of 'Publish or Perish' for Libraries? Whilst the increasing shift towards open access is creating new roles and opportunities for both libraries and librarians, some argue that it is threatening one of our key functions as the unlocker of paywalls to subscription journals. In reality, I believe it is a catalyst for creative destruction rather than a "threat"; our traditional role will change for sure, but ultimately this will generate even more opportunities to be involved in supporting research. One possible strand of this is the library's involvement (or otherwise) in administering, or even funding, the article processing charges (APCs) levied by many commercial journals for making articles freely accessible. Such charges represent the cost of publishing (which is not free, although usually significantly lower than APCs) and the often-cited "value added" by publishers through branding, editing, marketing and so on. However, another route points to the potential for libraries to become publishers themselves. Libraries are intrinsically credible, reliable and neutral - three characteristics that make them ideal partners in scholarly communications. Our traditional association with collecting, archiving and providing access to information should ensure we are perfectly placed to extend these activities to academic publishing. Selling our services as publishers should even be easy in theory; we have as good an understanding of research workflows, copyright issues, research dissemination and impact as anyone. Is this not also "adding value" in the same way that commercial publishing houses do now? Just as our Special Collections serve as a unique and priceless point of differentiation, so too can our output as scholarly publishers. Creating and publishing unique content is potentially a very powerful way of demonstrating our value. There are already significant opportunities for digitising back issues of existing print journals, opening them up to a new audience and a more sustainable future (the Journal of The Statistical and Social Inquiry Society of Ireland, recently made openly available by Trinity College Dublin, is a great example of this). However, perhaps the biggest barriers that libraries face in moving into this space are the existing practices, traditions and culture, an issue identified by Stuart Lawson's research at Anglia Ruskin who notes that "the question of whether there is sufficient support for such as service among academics...is still uncertain". There are signs that existing traditions and culture are changing however, especially in some disciplines. The success of the PeerJ model points to this for one. Until more libraries actively engage in publishing projects and demonstrate that they can serve as valuable partners in the process (as many have already successfully done), there will likely be some hesitation and uncertainty that the concept can work effectively. However, it is very difficult to argue with the "value added" by libraries involved in projects like the JSSISI, and open access publishing at the University of South Florida, University of Pittsburgh and York University. For more ideas and discussion of libraries as publishers, see The Lib Pub blog.